Issuing a call to arms, an angry Reverend Al Sharpton today claimed Republicans utilized fraudulent tactics to win yesterday's gubernatorial recall vote in Wisconsin. Claiming the results "emboldened the right-wing", the MSNBC host told radio listeners it was a mere trial run for widespread vote theft designed to steal November's presidential election outright. Comparing their loss to a boxing match, Sharpton told supporters they could either remain "groggy" after a hit on the head or "double-down and get ready to fight"
AL SHARPTON: This Wisconsin recall election, I think I did my commentary from the Washington DC office this morning. It really is a wake-up call because despite that fact that clearly money was one of the main factors, it’s not going anywhere by November. If anything, I think that it has emboldened the right wing, it has emboldened these billionaires. There was all kinds of voter-suppression schemes from ID [card required to vote], to not letting students vote and registration. It almost was a test run for what they’re going to do in November. The question is what are we going to do about it? We can either act like it means nothing and it’s like in a fight and you got your head hit and you're groggy and you’re going to be in denial, or you’re going to admit that someone hit you hard, clear your head and let’s double-down and get ready to fight. So, Reverend, what kind of response should we expect? Will it stay within the bounds of the law? Tuesday's election, just like the 2010 election, was indeed a trial run for 2012. The Tea Party is reclaiming Sweet America from the "progressive" liberal mob that hijacked it. Sharpton is a race pimp, that sees racism under every rock, except black rocks. Where was this whore when Franken "won?" I live in Wisconsin. I voted for Walker. Al, who doesn't live here and can't vote here, has decided either I'm too stupid to know what's best for me or someone slipped me a twenty on my way into the poll. What galls me here is Al is saying democracy and the decision of the people of this state are wrong because he doesn't agree with it. You are a Reverend, Al, not God. Try harder Al, much harder. Because felons and those with warrants out for their arrest dont want to carry﻿ ID? Al you are a jerk. I won't even call you reverend Al because no racist should be called by that name. They should call you by your real name. A black racist PERIOD. 1. Polls taken by pollsters leading up to an election. 2. The actual vote by voters at the polling place. ...only #2 matters. Problem is the Dems think 3 should dictate 2. If in Wisconsin, there were union thugs being used as Dem poll moniters, no union member who hates what their union is doing will probably lie to the person conducting the exit poll. 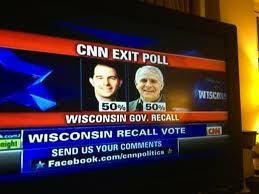 So when Wolf Blizter & Ed Schultz were exited & hopeful about Walker losing wghen exit polls were saying it was within 1 or 2, when it was really 8 or 9 in favor of Walker, you now know why the leftists think that there was voter fraud. I also think there is more then a bit of projection going on here. Oh,Boy.I am glad to see that some things do remain the same.He has always been a "cheap hack" a simple minded racist,and a "cheap trick".He would sell and speak falsehoods about his mother if he thought it would give him a platform to yap.The shame is that african-americans embrace a s**t like him.